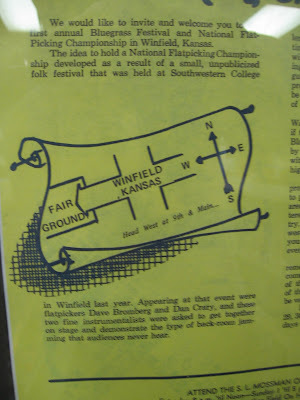 Greetings to those persistent enough to check these pages over the long year waiting for the next spin on the dance floor that we call Winfield. The Old Folkie (not fogie, thank you very much) is storing up extra braincells as we speak, and will again be posting some items of interest concerning the past, the future and most importantly, the presence of music in the Walnut Valley. I'm going to start today with the photographs of the 1972 flyer that I transcribed in the post from May 18th. 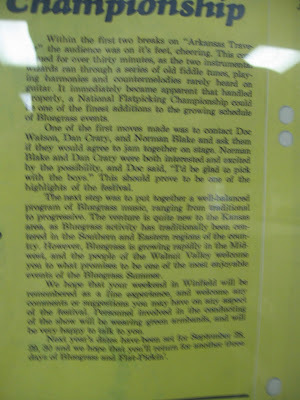 These were taken through the glass display case at the Winfield Library, so the image is not too clear. These were taken with the intention of being able to transcribe the text and not as an image for the web. But here you have it. This first page of the 1972 flyer mentions the Bromberg and Crary performance that I described as this blog was getting started almost a year ago (Sept.2, 2007), and confirms my long-held suspicion that that one performance was so phenomenal, and the roots that it drew on were so deep, that it spurred a contest and even an entire festival that have blossomed like few others in the ensuing thirty-six years. I'll mention that there are plans to put the history that this blog has been uncovering into a more readable book form. It seems like the reverse-chronology format inherent in blogging can be a little confusing for any kind of permanent record. I welcome any and all suggestions in this regard, including possible funding sources, publication ideas, or personal histories from the festival's early days. I'm especially interested in information about The Black Eye, the little coffee shop that helped everything get started. Beyond that, I would hope that tent stakes were being collected, reliable dog and cat care is being arranged, and that ample stores of frijoles rancheros are being frozen with love and sufficient cilantro.